1 How quickly can I expect to get my fitness equipment? We usually deliver to you within 3 working days. If required we can usually deliver out of hours although this may attract an additional charge depending on circumstances. 2 Do Hire Fitness carry out credit checks on me? We simply check the electoral roll and we normally ask to see some form of photo ID, such as passport, driving licence etc. We also like to see proof of address such as on a bank statement. 3 Does the fitness equipment get checked regularly for safety? 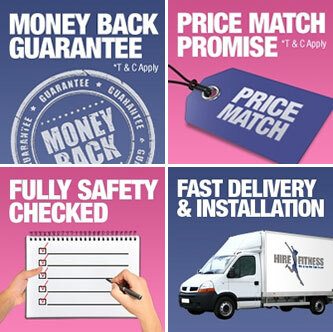 Yes, every piece of gym equipment is comprehensively checked before every delivery and you will recieve a copy of the safety check sheet as proof of the work being carried out. Our checks include motors, computers, moving parts and electrical safety checks. 4 Do I have to have a Credit or Debit Card? Yes. We only hire fitness equipment to people with a UK or Irish bank account. 5 How do I return the equipment when I've finished with it? Just give us 7 days notice in writing prior to the minimum hire term expiring. 6 What if I can't decide what type of fitness equipment would suit me best? If you're not sure what type of fitness equipment would work best for you, we'd be delighted to offer you a free 20 minute in-home demo to help you decide what's best for you. 7 What is an Elliptical Cross Trainer? An elliptical cross trainer works both the upper and lower body muscle groups simultaneously. The cross trainer has a smooth action that moves naturally with the body and is an impact free workout thereby gentle on the joints. 8 What if I haven't exercised for a while? We always recommend that customers consult their doctor before embarking on any fitness regime, simply as a precautionary measure. Staff at Hire Fitness are not able to give fitness advice with regards to your personal health. 9 What if I can't part with the equipment at the end of the hire - can I keep it? Yes, you can buy the item from us at the end of your rental period and we even offer you generous discounts of up to 40%. 10 Would I get a discount for renting more than one piece of equipment? Yes, if you hire 3 pieces of gym equipment, we will hire you the cheapest piece for free. Please note, this offer is not available online so please call your local Hire Fitness sales office to to take advantage of this. Offer is subject to availability. Ts and Cs apply. 11 As a company, can we get corporate discounts? Yes. All you have to do is call us to register your company with us and then all of your employees will receive discounts on the rental prices. 12 Is the fitness equipment insured? Our equipment is covered by insurance whilst on the premises of Hire Fitness and in transit. Whilst the equuipment is with you, it is your responsibility to ensure that your household or work insurance covers all damage risk whilst in your possession. 13 What if I get bored with my fitness equipment after a few months? For a small delivery charge (depending on your location) we will deliver another piece of fitness equipment of your choice to help maintain your motivation and we will take the old one away. 14 How do I make my rental payments? On the day of delivery to you, we take 4 weeks rental in advance (and a security deposit if applicable, which is equal to another 4 weeks rent) plus the delivery fee (if applicable). We will also ask you to complete a Credit / Debit Card authority so we can collect all subsequent rental payments when due automatically every 4 weeks until you decide you no longer need the equipment; we will stop the automatic payments when we have collected the equipment from you. 15 Do you deliver fitness equipment to Ireland? Yes we have several offices in the Republic of Ireland and Northern Ireland.